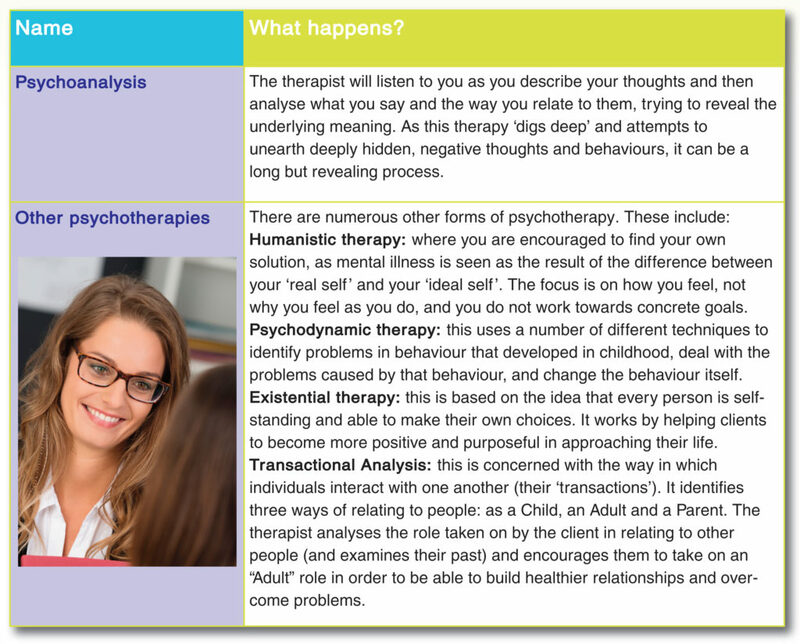 This is a brief guide to the main talking therapies used to treat serious mental illness. Note: this guide has been produced using information available at the time of preparation. To ensure you have the most up-to-date information available, please speak to your GP or Care Coordinator. Psychotherapies offer some of the more in-depth talking therapies that attempt to get to the root of emotional problems and to uncover and address possible causes of mental illness. Psychotherapies tend to be longer-term talking therapies (sometimes years long). Some models of psychotherapy are summarised below. Some therapists follow one model strictly but many will use one or more models to find the best treatment for an individual. Counselling and psychotherapy are on a continuum where counselling tends to be short term and psychotherapy is longer term. There are many theoretical models of counselling and psychotherapy and all of them use counselling skills to facilitate self understanding. However, counselling in itself tends to focus on immediate problems and on finding ways of coping with them rather than changing the way you think, for example, or exploring the deep-seated causes behind your problems. CBT is recommended by NICE for the treatment of psychosis and schizophrenia. * The goal of CBT is to change the way a client thinks about a particular thing in order to solve a specific problem. Like CBT, CAT is based upon changing behaviour, although it is different in that it involves looking into a client’s past in order to identify poor coping habits. Creative therapies are a form of psychological therapies based more on activity and not necessarily on talking, although engagement with a therapist is usually an important aspect. Creative therapies can provide a direct means of exploring and resolving mental health problems, for example by expressing thoughts or feelings which you might not be able to express in words. Creative therapies can also assist more generally by helping you to get in touch with how you feel, improving communication with others, relieving anxiety, and improving wellbeing. *NICE guidelines are used by doctors in the NHS to decide what treatment may be suitable for patients.